The exhibit title: “Between Heaven N’ Hell” refers to Ryan’s love/hate relationship with his creative process and the adventures it takes him on. Ryan Thomas Monahan hails from Yorkville, Illinois. 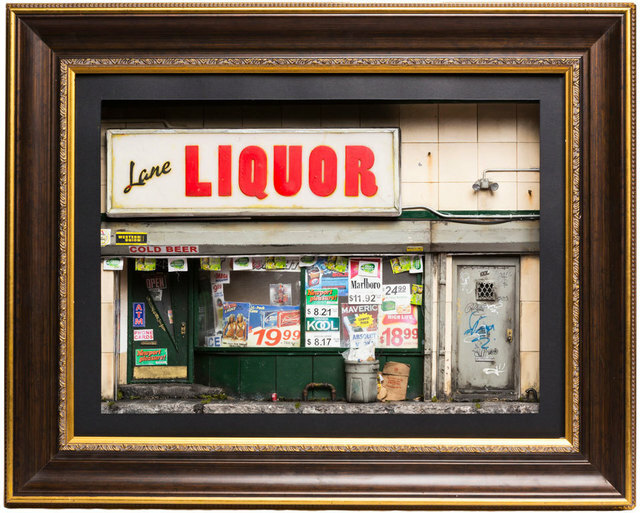 Utilizing a combination of physical and imaginative exploration Ryan creates miniaturized three dimensional portraits of urban landscapes. His desire to capture the beauty and grime of the world we live in is filled with moments of agony and glory. The exhibit title: “Between Heaven N’ Hell” refers to Ryan’s love/hate relationship with his creative process and the adventures it takes him on. Look around, could you reproduce your environment using materials of no relation to their original purpose and fit it all inside a space the size of a shoe box? Construction is a difficult process; the required knowledge brings many different professions together. However, in this instance, Ryan is the ultimate construction worker – He does it all from the ground up at 1/24 the scale. The majority of Ryan’s work portrays a fictional location. Creating a unique environment allows him to pull inspiration from visual and personal influences. It also allows him to consider using anything and everything for materials – Call him a “Junk Drawer Pirate”. Never ending options opens the door to a world of infinite challenges and outcomes. For instance, his new work titled “Brinbane St.” is set in a subway station, quite possibly one of the grittiest locations you can conjure. 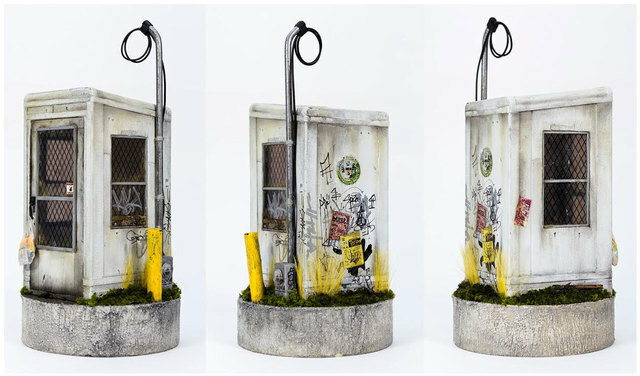 No detail is spared – Every surface has been painstakingly covered in rust, dirt and funk. 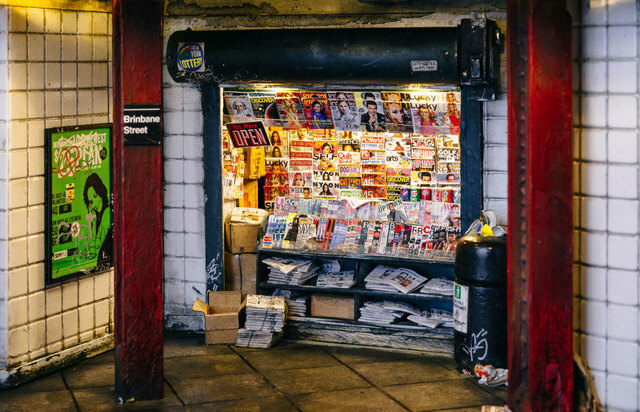 Set in the background is a typical subway newsstand featuring miniaturized magazines and newspapers so realistic looking you want to read one. To top it off, this piece hangs framed on the wall, flip a hidden switch and lights illuminate the newsstand. The combination of attention to detail and unique viewing perspective truly puts you into the scene. 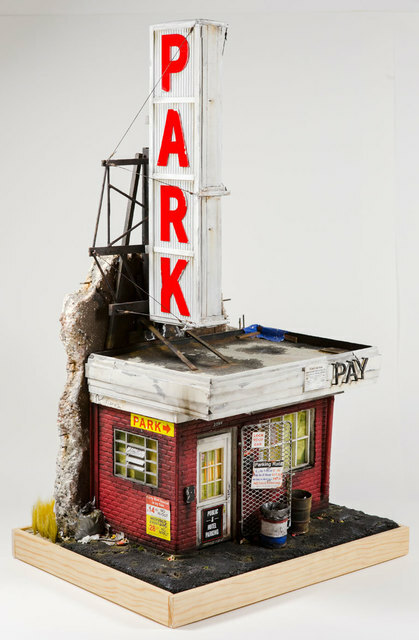 Another interesting work is “Wabash” which is a free standing structure featuring a dilapidated “Pay to Park” stand. The visual is one of loneliness and despair – With no parking lot in sight the building takes on an even more desperate and loathsome existence. Once again no detail is spared – The sign is beautifully constructed and magnetized for easy handling. The “Pay” neon sign is burned out but we see a faint paint discoloration from color burn. The addition of a broken pay phone and this place is definitely between heaven and hell. Join us Saturday, November 12th from 7-9pm for an opening reception.